What are your unforgettable 2008 zoo moments? Share with us in the comments! 8. A New Giraffe is Here! The grizzly bears got a special winter treat this week. Part of our Winter Celebration enrichment for the animals, zoo staffers got out of the office and joined keepers in decorating some trees in the bears’ exhibit with spaghetti noodles, slices of pineapple, cherries, marshmallows, and even some honey. The volunteers did a good job of making the trees look festive, despite the strong winds blowing the treats all around! Once the two grizzlies were let back into their exhibit, they wasted no time splitting up and each went to a different tree to enjoy the goodies. As the many people that came to see the bears watched, the bears themselves had a little trouble with the wind in their excitement. One had to rebalance himself and step back while the other decided the best way to solve the problem was to sit as close to the tree as he could, even if it meant breaking some branches! 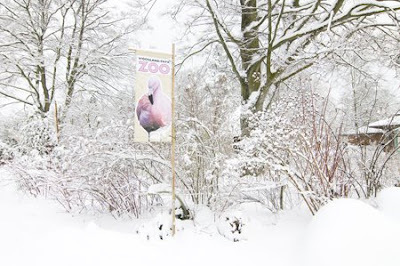 Our recent bit of nasty winter weather certainly isn't unprecedented here at the zoo. Back in 1916, the "Great Snowstorm of 1916" occurred the end of January through the beginning of February of that year. All of Phinney Ridge was heavily blanketed under snow for many days. Pictured here are a couple shots from our archives: the first shows the former Primate House, built in 1911 and has the distinction of being the zoo's first heated structure. The building was demolished in 2005 and the location is now the site of Zoomazium. The photographer's location would have been about there the exit is for the Tropical Rain Forest dome is now, looking west towards the Lemur Island exhibit. The second shot is of the "umbrella exhibit," a netted pool which housed ducks and/or seals. The Primate House is visible in the background to the right and the old bear cages (replaced with open grottos in 1950 and now housing Asian bears and Sumatran tigers). The photographer would have also been looking west, near the current site of the zoo's main restrooms. We hope you are all safe during this most recent "great snowstorm" and we'll also like to give kudos to our keepers, grounds and maintenance staff, volunteers and many others who braved the elements to care for the animals. Come in on. It's beautiful on grounds, and tickets are HALF PRICE! Woodland Park Zoo is closed today, Monday, December 22. But enjoy the slideshow in the meantime! See you again soon! Savvy zoo visitors know that while snowfall at the zoo might make it hard to spot some of the animals, others are picture perfect out in the elements. The novel weather brings out the inquisitive nature in many zoo animals and creates a beautiful backdrop for shutterbugs. Photos by Ryan Hawk and Dennis Dow. Part Two: Did You Know? And now for Part II of our Did You Know blog series tackling some of the most frequently asked questions from zoo fans and visitors about how the zoo works. Many times throughout the year, we are contacted by members of the public, requesting that we “adopt” their unwanted animal, mostly birds and reptiles such as boas, pythons, lizards and others. For the most part, we cannot accept these animals for a variety of reasons. First is the sheer number of animals; if we accepted every green iguana we were asked to take, we would quickly be an iguana-only zoo! Second is health. Every animal that comes to the zoo must enter a quarantine period to ensure they are in general good health and are not exhibiting any symptoms of potentially contagious diseases. This not only affects them, it could affect the health of animals (and people) already at the zoo. And third is provenance. We make every effort to know the origin of the animal in our care so that we have an idea of genetic background and health. Many animals, particularly reptiles and birds, may have come to this country through the illegal pet trade, or from unethical breeders. Without firm knowledge of their background, animals could harbor disease or genetic problems that could affect them, and potential progeny, down the line. So what should you do if you have an animal you need to give away? Start by contacting your local animal shelter or see if your local vet keeps a list of people interested in adopting animals. 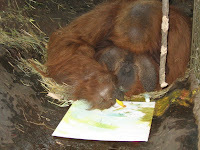 No art collection is complete without an original painting by Woodland Park Zoo's 40-year-old orangutan, Towan. And with the holidays here, now's your chance to give a unique gift to the animal lover in your life. 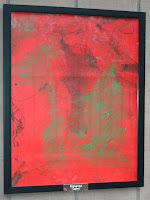 Towan's latest work, a 16"x20" painting done in festive acrylic red and green to reflect the theme of the holiday season, comes framed behind glass in a matte black wood frame. Included is a certificate of authenticity. Bidding has begun on eBay, ending December 12 at 10:36:30 PST. Don't miss your chance! Funds raised through this eBay auction will help support the 2009 conference of the Third Annual International Congress of Zookeepers/36th American Association of Zookeepers National Conference to be held at Woodland Park Zoo. 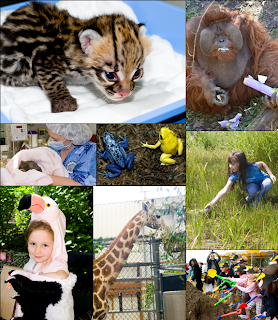 This combined ICZ/AAZK conference represents the first time these two professional zoo keeper organizations have joined to bring together animal care professionals from around the world to the United States. The conference will improve the levels of communication between keepers from around the world, and serve as a basis for supporting the development of zoo keeping as a profession in regions where professional keeper associations do not currently exist. This will ultimately benefit wildlife located in zoos and those in conservation projects everywhere. Photos: Carolyn Austin, Ric Brewer.